Meet the aesthetical wall panels from Hunter Douglas Architectural. Custom designed and manufactured walls to meet your demands. Available as standard or with acoustic properties, these sound absorbing panels are great for meeting rooms, offices, schools, music rooms, hotels, auditoriums and many more. The acoustic wall panels are perfect for any space where acoustic control is an important requirement. You can use our linear HeartFelt® ceiling system now also as a wall application? Hunter Douglas can offer you great acoustic wall panels. An acoustic wall can be an aesthetical design element in your project to create inspirational rooms. Combining several architectural products like felt, solid wood or veneered wood as a wall is a true gift for an architect. Our products are designed to work for you. Hunter Douglas likes to think outside the box and listen to your ideas. Innovation is our priority and our focus is on developing the best wall applications that meet your demands. Try our unique linear HeartFelt® wall, or co-create and have a custom wall panel in veneered wood! To create the best solutions we train our technical consultants and engineers to be the best professionals in detailing acoustic walls. They work with you to deliver a wall system even in the most complex building projects. We pride ourselves in working on applications of every kind: from airports, to stadiums and beyond, with solutions in sustainable materials. Integration of systems creates a wall topography that gives every space its own personality. We conceive, manufacture and advise the best wall applications! Creating a partnership with the worlds leading architects is our mission. 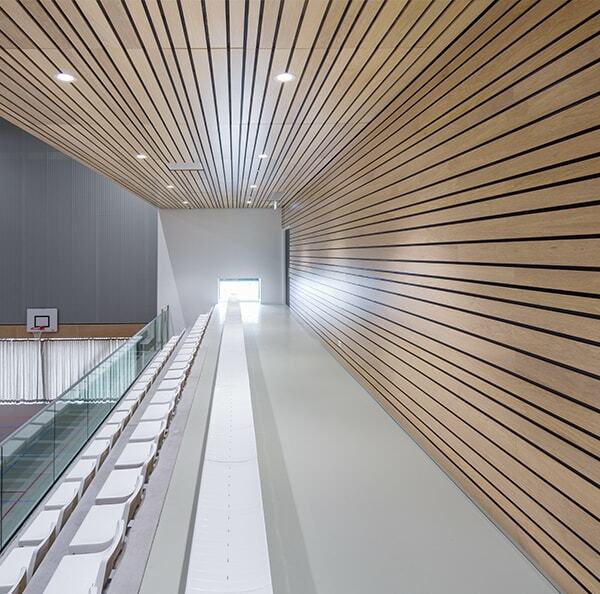 Our wood panels can be perforated to create an acoustic wooden wall. Several perforations are available to create the required absorption value. 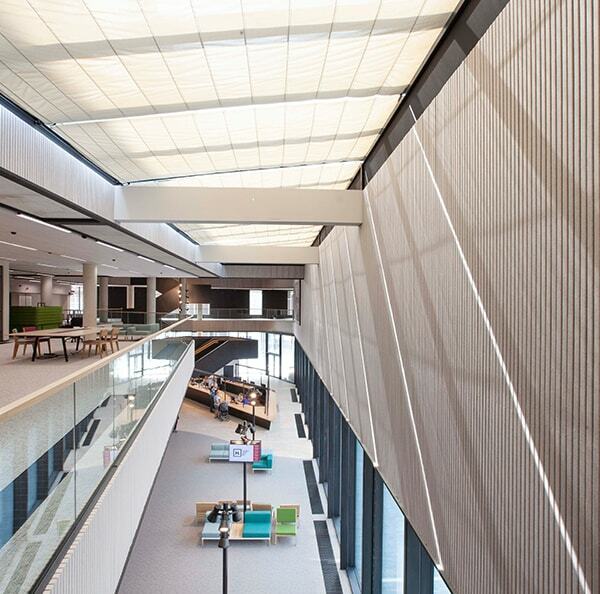 Mix standard or custom perforated panels with plain ones, or go for our special Nano Wood perforation; only visible from close up, this perforation creates invisible acoustical absorption. Designers are encouraged to discuss their ideas with our technical consultants for the best solution. Next to aesthetics comes comfort. Ceilings and walls play a dominant role in getting acoustic comfort to the desired level. Wall paneling will help you with this and give a boost to your acoustic performance. A wall in combination with a Hunter Douglas ceiling is the perfect acoustic match! Hunter Douglas Architecturals' commitment to sustainability and responsible development is evident by our continuous efforts to address environmental concerns, improve production processes, eliminate waste and reduce maintenance. Our focus is to contribute to and educate people on designing healthier, more resilient spaces. For decades we have been using ever higher ratios of recycled aluminum for our ceilings. 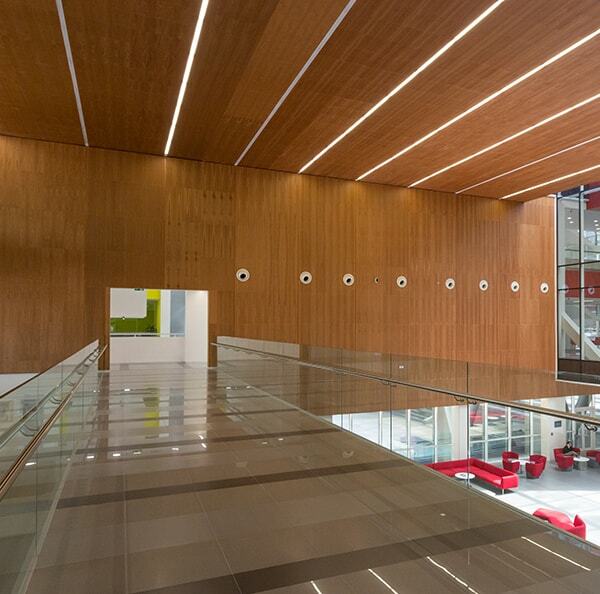 Our metal ceilings and HeartFelt ceilings and walls are Cradle to Cradle certified. 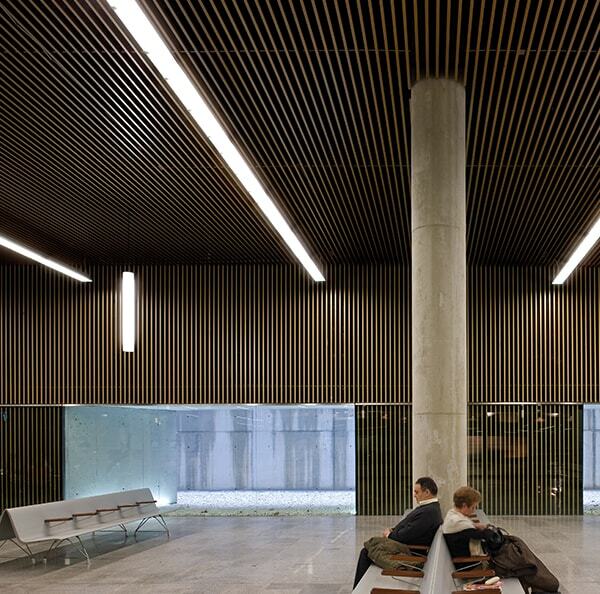 Our solid wood and veneered wood ceilings and walls can be made from FSC wood. 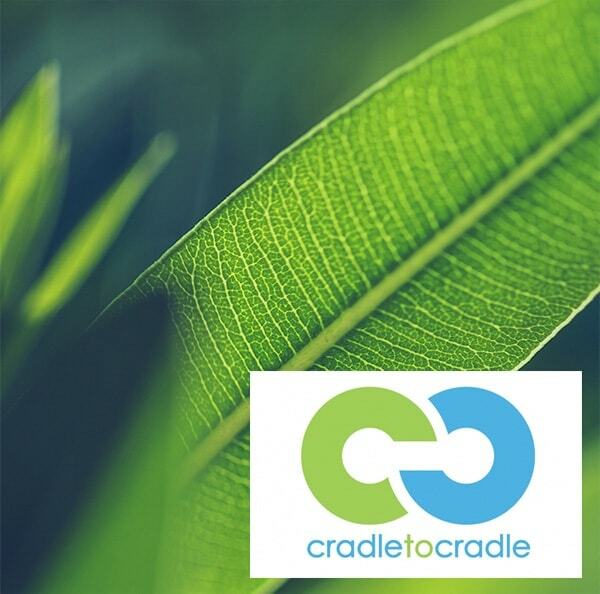 For each product and material we seek to collaborate with the best certification institutions to warranty sustainable solutions. The whole range of Hunter Douglas Architectural metal & HeartFelt® wall program is C2C level bronze certified. Use the filters below to browse our full selection of Walls Products.